A few times a month I write for a local magazine called Knoxville Families Magazine, here’s a piece I wrote about chores and goals for our kids. Seems fitting for a plan for the New Year! Enjoy. If you’ve followed me at all you know that I am absolutely clear about my feelings on work. Our family works. No, we don’t live on a farm or have an especially expansive array of animals or children to care for. We live in a typical suburban neighborhood in a typical suburban home with a typical suburban yard. We just believe that working is an important life skill and that some things must be earned in order to be appreciated. Age 1: “Let’s pick up your toys” is a funny game where baby attempts to fill a bucket with the toys on the floor just to dump them out again. “Pick up” is fun – it’s challenging, it’s a learning of sorts. Age 2: “Let’s pick up your toys” is something you do 1,000 times a day as you move from activity to activity. It’s mildly fun – you can play toss or catch or race, the toys are large and the pick up is quick. Age 3: “Let’s pick up your toys” is mildly more difficult. You have to create elaborate games in which to pile all the toys into a car and then dump the car in the bucket before it spills over onto the floor. The toys are littered throughout the house. It’s manageable but definitely not fun any longer for either of us. Age 3 1/2: “Let’s pick up your toys” is met with defiance: “you pick up the toys,” or avoidance: “I’m not done playing yet,” or flat our refusal: “NO.” We call this developmental stage the magic age. 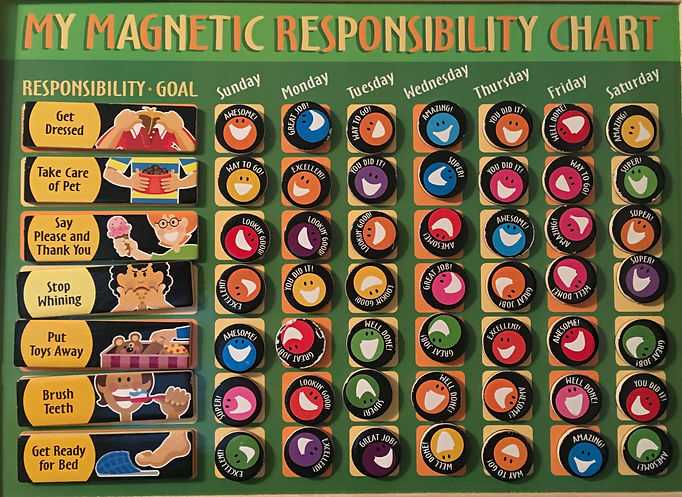 I saw the magic age creeping in throughout the summer and knew as soon as school started the chore chart would surface and we would begin the painstaking weeks of training a new little person….